This article is about the Canadian city. For other uses, see Saskatoon (disambiguation). 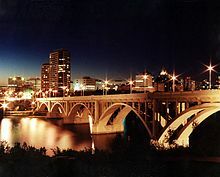 Saskatoon (/ˌsæskəˈtuːn/) is the largest city in the Canadian province of Saskatchewan. It straddles a bend in the South Saskatchewan River in the central region of the province. It is located along the Trans-Canada Yellowhead Highway, and has served as the cultural and economic hub of central Saskatchewan since it was founded in 1882 as a Temperance colony. "Paris of the Prairies", "Toontown", "S'toon", "Hub City", "POW City" (for potash, oil and wheat), "The City of Bridges", "Saskabush"
With a 2016 census population of 246,376, Saskatoon is the largest city in the province, and the 17th largest Census Metropolitan Area in Canada, with a 2016 census population of 295,095. The City of Saskatoon has estimated its population to be 278,500 as of July 2018, while Statistics Canada has estimated the CMA's population to be 323,809 as of 2017. Saskatoon is home to the University of Saskatchewan, the Meewasin Valley Authority which protects the South Saskatchewan River and provides for the city's popular riverbank park spaces, and Wanuskewin Heritage Park, a National Historic Site of Canada and UNESCO World Heritage applicant representing 6,000 years of First Nations history. The Rural Municipality of Corman Park No. 344, the most populous rural municipality in Saskatchewan, surrounds the city and contains many of the developments associated with it, including Wanuskewin. Saskatoon is named after the berry of the same name, which is native to the region, and is itself derived from the Cree misâskwatômina. The city has a significant Indigenous population and several urban Reserves. The city has nine river crossings and is nicknamed "Paris of the Prairies" and "Bridge City." Historic neighbourhoods of Saskatoon include Nutana and Riversdale, which were separate towns before amalgamating with the town of Saskatoon and incorporating as a city in 1906. Nutana, Riversdale, their historic main streets of Broadway Avenue and 20th Street respectively, the downtown core and other central neighbourhoods are seeing significant reinvestment and redevelopment. Sutherland, the rail town the city annexed in 1956 that lies beyond the University lands, is now another historic neighbourhood. The name Saskatoon (in Cree: sâskwatôn, "Saskatoon" or the locatives: misâskwatôminihk, lit: "at the saskatoon berry", misâskwatôminiskâhk, "at the place of many saskatoon berries", mînisihk "at the berry") comes from the Cree inanimate noun misâskwatômina "saskatoon berries", which refers to the sweet, violet-coloured berry that grows in the area. However, he wrote, "the truth appears to be somewhat less dramatic. The area was long-known to the local Cree as a good place to stock up on willow wands for arrow shafts. Thus the name of the place was “Sask-kwa-tan” – roughly, “the place where willows are cut”", close but not the saskatoon berry. In 1882, the Toronto-based Temperance Colonization Society was granted 21 sections of land straddling the South Saskatchewan River, between what is now Warman and Dundurn. The aim of the group was to escape the liquor trade in that city and set up a "dry" community in the Prairie region. The following year settlers, led by John Neilson Lake, arrived on the site of what is now Saskatoon and established the first permanent settlement. The settlers travelled by railway from Ontario to Moose Jaw and then completed the final leg via horse-drawn cart as the railway had yet to be completed to Saskatoon. In 1885 the Northwest Rebellion affected the tiny community in a variety of ways. Chief Whitecap and Charles Trottier passed through the present day University campus on their way to join Louis Riel's armed forces at Batoche, Saskatchewan. Following the fighting at the Battle of Fish Creek, and the Battle of Batoche, wounded Canadian soldiers convalesced at the Marr Residence which is today a historic site. A few died in care and were buried in the Pioneer Cemetery near the Exhibition Grounds. A town charter for the west side of the river was obtained in 1903 (Nutana became a village in that year). In 1906 Saskatoon became a city with a population of 4,500, which included the communities of Saskatoon, Riversdale and Nutana. In 1955 Montgomery Place and in 1956 the neighbouring town of Sutherland were annexed by the fast-growing City of Saskatoon. Saskatoon lies on a long belt of rich, potassic chernozem in middle-southern Saskatchewan and is found in the aspen parkland biome. The lack of surrounding mountainous topography gives the city a relatively flat grid, though the city does sprawl over a few hills and into a few valleys. The lowest point in the city is the river, while the highest point is disputed between the suburb of Sutherland in the east side and the Silverwood-River Heights areas in the city's north end. Saskatoon, on a cross-section from west to east, has a general decline in elevation above sea level heading towards the river, and on the east bank of the river, the terrain is mostly level until outside the city, where it begins to decrease in elevation again. Saskatoon is divided into east and west sides by the South Saskatchewan River. It is then divided into Suburban Development Areas (SDA) which are composed of neighbourhoods. Street addresses are demarcated into north and south (for avenues aligned in those directions) and similar east and west (for streets aligned in those directions). West of the river the demarcation line for north and south addresses is 22nd Street, while east and west are divided by Idylwyld Drive (north of 20th Street) and Avenue A (south of 20th). On the east side, Lorne Avenue demarcates east and west while Aird Street marks the north/south boundary, except in the Sutherland community where a separate east/west demarcation takes place with Central Avenue as the boundary (there is, however, no separate north/south divide). As a result of the unusual demarcation on the east side, few streets actually carry a "North" or "West" designation. A second major water feature aside from the river is the Hudson Bay Slough, a remnant of a glacier-formed body of water that at one time dominated the northern end of the city. Industrial development has resulted in most of the slough being drained, however a large remnant has been preserved off Avenue C as part of RCAF Memorial Park, and another portion remains intact within the Hudson Bay Industrial area. Pike Lake and Blackstrap Provincial Parks are 40 km (25 mi) south of the city. Blackstrap Park is often used for school field trips. Batoche is 90 km (56 mi) north of the city. Saskatoon experiences a cold semi-arid climate (Köppen: BSk) near the humid continental climate (Dfb), with typically warm summers and long, cold winters. Climate data from University of Saskatchewan, in the inner city meets semi-arid criteria. This is due to slightly higher average annual temperature and slightly lower average annual precipitation than the Airport, on the city's northwest periphery. The city has four distinct seasons and is in plant hardiness zone 3b. Saskatoon has a dry climate and sees 340.4 mm (13.40 in) of precipitation per year on average, with the summer being the wettest season. Saskatoon is sunnier than average in Canada as a result, averaging 2,268 hours of bright sunshine annually. The extreme temperatures are typically accompanied by below average levels of humidity. Thunderstorms are common in the summer months and can be severe with torrential rain, hail, high winds, intense lightning and, on rare occasion, tornadoes. The frost-free growing season lasts from 21 May to 15 September, but due to Saskatoon's northerly location, damaging frosts have occurred as late as June 14 and again as early as August. The average daytime high temperature peaks at 25.8 °C (78.4 °F) from July 31 to August 8. The "Blizzard of 2007" was described by many residents as the worst they had seen and paralyzed the city with its low visibility, extreme cold and large volume of snow. Winds rose to over 90 km/h (56 mph) and an estimated 25 cm (9.8 in) of snow fell throughout the day. Many area residents took refuge overnight at area work places, shopping centres, hospitals and the university. The highest temperature ever recorded in Saskatoon was 41.5 °C (107 °F) on 6 June 1988. The lowest temperature ever recorded was −50.0 °C (−58 °F) on 1 February 1893. The 2016 census listed Saskatoon's population at 246,376, a 10.6 per cent increase over 2011. A civic estimate at the end of 2016 had Saskatoon's population at 265,300 and Saskatoon's CMA population as 323,809. According to the 2006 census, 18% of the population consists of youths under the age of 15, while those over 65 constitute 13% of the population. The median age of Saskatoon residents is 35.5 years of age, four years younger than Canada as a whole. The above land area figure was provided by the City of Saskatoon in January 2006 and takes into account recent annexations up to that point. It does not include the two large annexations of land that occurred in the summer of 2010. These portions of land have been zoned under the provincial land management acts. In terms of race, according to the 2001 census, 190,120 or 85.4% of the city's population were white Canadians, 19,900 or 8.9% were Aboriginals, with less than 5% belonging to other visible minority Canadians such as Han Chinese, South Asians, etc. combined. Located outside the city limits, Wanuskewin Heritage Park is a National Historic Site, and an archeological site. The park showcases the history of the Northern Plains peoples in the region. Some 78.5% of Saskatoon's inhabitants profess to be Christian, mostly Protestant (40.1%) and Roman Catholic (32.5%). Another 19.6% of Saskatoon's inhabitants do not profess a religious faith at all. Minority faiths include Sikhism, Buddhism (0.7%), Judaism, Hinduism, and Islam (0.6%). The Saskatoon area was inhabited long before any permanent settlement was established, to which the ongoing archaeological work at Wanuskewin Heritage Park and other locations bears witness. Canada's First Nations population has been increasingly urbanized, and nowhere is that more apparent than in Saskatoon, where the First Nations population increased by 382% from 1981 to 2001; however, a portion of this increase, possibly as much as half, is believed to be due to more people identifying themselves as Aboriginal in the census rather than migration or birth rate. Saskatoon has the second highest percentage of First Nations population among major Canadian cities at nearly 9%, behind Winnipeg at 10.2% and Regina close by with 8%; in certain neighbourhoods such as Pleasant Hill, this percentage exceeds 40%. Most First Nations residents are of Cree or Dakota cultural background although to a lesser extent Saulteaux, Assiniboine, and Dene communities also exist. Saskatoon also has a substantial Métis population and is close to the historically significant Southbranch Settlements to the north, as well as the Prairie Ronde settlement near Dundurn, Saskatchewan. Saskatoon's major arts venue is TCU Place, which is next to Midtown Plaza downtown. Since opening in 1967, it has hosted scores of concerts, theatrical performances, live events such as the Telemiracle telethon, high school graduation and university convocation ceremonies, and conventions. It is also home to the Saskatoon Symphony Orchestra. It recently underwent a multimillion-dollar renovation to its main theatre (named in honor of former mayor and senator Sidney Buckwold). Saskatoon was the 2007 host city for the Juno Awards, Canada's foremost music industry honours. Shakespeare on the Saskatchewan is an annual Shakespeare in the Park festivals held in Saskatoon. For rock concerts and major shows, SaskTel Centre is the main venue. It is Saskatchewan's second largest arena, with a capacity of 15,195 for sporting events and 14,000 for concerts. Musical acts from Saskatoon include Joni Mitchell, Kyle Riabko, Wide Mouth Mason, The Northern Pikes, The Sheepdogs, and The Deep Dark Woods, as well as countless others popular at both local and regional levels. Saskatoon hosts many festivals and events in the summer, including the Shakespeare on the Saskatchewan Festival, The Great Plains Comedy Festival, the Jazz Festival, the Saskatchewan Children's Festival, the Saskatoon Fringe Theatre Festival (a showcase of alternative theatre), Saskatoon Folkfest (a cultural festival), Doors Open Saskatoon and the Canada Remembers Airshow. For over 25 years, Saskatoon has hosted a gathering of antique automobiles, (mainly from the 1960s) that has grown into an event called "Cruise Weekend". The event is usually held on the last weekend (Friday, Saturday and Sunday) in August. Activities include a poker derby, dances, and a show 'N' shine with over 800 cars from all over western Canada. No admission is charged and everyone is free to walk around and enjoy the atmosphere. The city's annual exhibition (now called the Saskatoon Exhibition but also known in previous years as Pioneer Days and "The Ex") is held every August at Prairieland Park. In the late 1990s, the Saskatoon Exhibition was rescheduled to August so that it no longer was in direct competition with the Calgary Stampede, which frequently overlapped the event. Saskatoon's Sikh community celebrates the festival of Vaisakhi with a parade held in May. The francophone community is represented by the Fédération des francophones de Saskatoon which organizes many cultural events. Mendel Art Gallery is an art gallery and conservatory located on the bank of the South Saskatchewan River. The Mendel Art Gallery was situated on the bank of the South Saskatchewan River. Its permanent collection exceeded 5,000 works of art. In 2005, it began a major renovation project that was to expand the size of the gallery by seventy percent. In September 2005, however, the City of Saskatoon announced it had entered discussions with the Mendel to the end of having the Mendel abandon its renovation/expansion project in favor of instead relocating the facility to a new arts and culture centre that is planned for the south downtown area. The Remai Modern Art Gallery of Saskatchewan constructed at River Landing, South & West of the previously constructed Remai Arts Centre, which houses the Persephone Theatre company. The Art Gallery had been built with matching contributions of $13 million from the Government of Canada and the Government of Saskatchewan. The City of Saskatoon and other key partners had also committed funding in support of the project. The total estimated costs for the Gallery, which serves as the destination centre for the River Landing project, was approximately $80.2 million. Established in 2017, Remai Modern is an art gallery located in Saskatoon's Central Business District. The Saskatchewan Craft Council Gallery is on the main floor of the Saskatchewan Craft Council building in the Broadway Avenue area. It is Saskatchewan's only public exhibition gallery dedicated to fine craft as an art form. Saskatchewan Craft Council Gallery presents seven to eight exhibitions each year. The SCC Fine Craft Boutique, located in the gallery, features the work of over 75 SCC fine craft artists. The Ukrainian Museum of Canada www.umc.sk.ca is on the banks of the South Saskatchewan River. The foremost attraction for Ukrainian culture in Saskatoon, it houses various artifacts such as textiles, tools, musical instruments, and clothing, with many pieces on display for public viewing. The Ukrainian Museum of Canada has other branches in Vancouver, Edmonton, Calgary, Winnipeg, and Toronto. The Saskatchewan Railway Museum is a railway museum located west of the city limits. The Meewasin Valley Centre, in Friendship Park, has information on Saskatoon's history, the South Saskatchewan River, and the future of the Meewasin Valley. Saskatoon is also home of the Saskatchewan Western Development Museum. This museum, one of four throughout the province, documents early pioneer life in Saskatchewan. It is noted for its interior recreation of a "Boom Town" main street, including one original building relocated from its original site. The Saskatchewan Railway Museum is just outside the city and includes displays of rolling stock and historic railway buildings from various parts of the province. The Forestry Farm Park and Zoo is a National Historic Site situated in the north east region of the city. The Forestry Farm was a historic nursery (dating from 1913) responsible for growing many of the trees planted within the prairie provinces. In 1966 the nursery operations were discontinued and part of the region turned into a municipal park. The city zoo is also housed within the park and features over 80 species of animals.Wanuskewin Heritage Park is a National Historic Site situated five km to the north of Saskatoon. It is an Aboriginal archaeological site and features displays, special events, and activities, recent renovations are on hold due to a lack of funds during the renovations. The Remai Arts Centre is a performing arts centre and home to the Saskatoon-based theatre company, the Persephone Theatre. Live theatre is a central, vibrant part of Saskatoon's culture. Saskatoon is host to a number of live theatre venues such as the Persephone Theatre, which is in the Remai Arts Centre at River Landing in downtown Saskatoon, The Refinery and the Saskatchewan Native Theatre Company. The Broadway Theatre primarily shows arthouse films – while the two-screen Roxy Theatre is an "atmospheric-style" second-run theatre that reopened in 2005 after sitting unused for over a decade. The remainder of the city's theatres are multiplexes. The only movie theatre in the downtown core is the Scotia Bank VIP Theatre; the Capitol 4 shut down on April 3, 2008. The city's other movie theatres are The Landmark Theatre in the new subdivision of Brighton, Rainbow Cinemas (a second-run cinema) and the Centre Cinemas in The Centre mall on the city's east side. Among the many movie theatres of the past that have come and gone was the Capitol Theatre, which opened in 1929 with a showing of the first talkie to be exhibited in Saskatoon. The Capitol closed in the early 1980s to make way for the Scotia Centre office tower; its name was transferred to the aforementioned Capitol 4 a block away. Saskatoon is home to a large blues/jazz community that frequents many bars and clubs known for their blues- and jazz-related acts, including Amigo's, Buds on Broadway, The Black Cat Tavern, Village Guitar & Amp Co., The Bassment, Capitol and formerly Lydia's. The Canadian rock band The Sheepdogs are from Saskatoon. Joni Mitchell calls Saskatoon her hometown. The Deep Dark Woods are from Saskatoon. One of the city's landmarks is the Delta Bessborough Hotel, known to locals as the Bez. Built by the Canadian National Railway, it was among the last railway hotels to be started before the Great Depression of the 1930s brought their era to a close. Although the building was completed in 1932, it did not open its doors until 1935 due to the Depression. The Bessborough and the Mendel Art Gallery are the only major structures on the river side of Spadina Crescent. One of the most frequently circulated photographs of Saskatoon is of the hotel framed in one of the arches of the Broadway Bridge. Completed in 1932, the Delta Bessborough is a Canadian grand railway hotel, and a historical landmark in Saskatoon. The Meewasin Valley Trail follows the South Saskatchewan River through Saskatoon. Summer activities include cycling, jogging and walking through parks and natural areas. Cross-country skiing is popular during the winter months, along with skating in Kiwanis Memorial Park. Access points are found throughout the city with interpretive signage and washrooms along the route. There are parks throughout the Meewasin Valley, with washrooms, picnic facilities, and lookout points along the river bank. In the winter the Meewasin Skating Rink is open free to the public; it is in Kiwanis Memorial Park beside the Delta Bessborough hotel. The outdoor rink has been open since 1980. For years, a parcel of land west of the Traffic Bridge, south of 19th Street, and east of Avenue C has been the subject of on-again, off-again redevelopment plans. The site formerly held the Saskatoon Arena, a power plant, a branch of the Royal Canadian Legion, and the head offices of the Saskatoon Public School Division; all these structures have been demolished to make way for redevelopment, with plans for same dating back to the 1980s. The most recent version of the plan called River Landing is ongoing. Calgary developer Lake Placid has proposed a 200 million dollar mega hotel/condo project to be built on the site although Lake Placid had difficulty securing financing and missed an October 30, 2009, deadline to submit a 4.5 million dollar payment for the parcel of land which seemingly killed the deal. On November 16, 2009, it was revealed by Lake Placid that the financing should be secure within a week. In April 2010, Saskatoon City Council voted in favour of entering new negotiations with Lake Placid over the site. Located in Saskatoon's Central Business District, Midtown Plaza is one of several shopping centres in the city. The Saskatoon Farmers' Market and some commercial sites have also been developed. Future plans separate from Lake Placid include the development of a new art gallery to replace the Mendel Art Gallery by 2014. Other landmarks in the city include the iconic Traffic Bridge (which was demolished in 2016 and is currently being replaced by a new structure evoking the appearance of the original), the University of Saskatchewan campus, and the large Viterra grain terminal which has dominated the western skyline of the city for decades and is large enough to be visible from Pike Lake Provincial Park 32 km away. Headquarters for Cameco, the world's largest publicly traded uranium company. Saskatoon's economy has traditionally been associated with the primary sector of the economy. The economy of Saskatoon has been associated with potash, oil and agriculture (specifically wheat), resulting in the moniker "POW City". Various grains, livestock, oil and gas, potash, uranium, gold, diamond, coal and their spin off industries fuel the economy. The world's largest publicly traded uranium company, Cameco, and the world's largest potash producer, Nutrien, have corporate headquarters in Saskatoon. Saskatoon is also the new home of BHP Billiton's Diamonds and Specialty Products business unit. Nearly two-thirds of the world's recoverable potash reserves are in the Saskatoon region. Innovation Place founded in 1980 brings together almost 150 agriculture, information technology, and environmental, life sciences and agricultural biotechnology industries in a science park or technology park setting. Saskatoon is also home to the Canadian Light Source, Canada's national synchrotron facility. Saskatoon’s digital media scene is growing with start-up tech companies such as Noodlecake, Point2, Vendasta Technologies, and Zu. One of Saskatoon's nicknames, "Hub City", refers to its ideal central location within Canada for distribution and logistics. Saskatoon John G. Diefenbaker International Airport with 105,620 aircraft movements in 2008 was listed as the 19th busiest airport in Canada, 12th busiest in passenger traffic. Saskatoon is developing the South Central Business District, or block 146, which is called the River Landing Project. Long range planning is underway for an expected city population of 325,000 by 2028 (2011 MXD report). Saskatoon was expected to see a 4.2 percent growth in gross domestic product for the year 2012. The city saw a 3.4% growth in 2004, 5.1% increase in 2005 and a 2.8% increase in 2006. Saskatoon held Canada's No. 1 economic growth spot for Canada in 2005 according to the Conference Board of Canada. The Conference Board again predicted the city would rate first for economic increase in 2012, showing a growth rate of 4.2%. The Saskatoon Regional Economic Development Authority (SREDA) has also been ranked amongst Canada's top ten economic development organizations by Site Selection magazine. The Saskatchewan Health Authority is responsible for health care delivery in the area. They operate three hospitals within the city boundaries, these include Royal University Hospital, Saskatoon City Hospital, and St. Paul's Hospital (Saskatoon). Royal University Hospital is a teaching and research hospital that operates in partnership with the University of Saskatchewan. The health authority also operates hospitals in smaller neighbouring communities. In addition to hospitals the health authority operates long-term care facilities, clinics and other health care services. Jim Pattison Children’s Hospital began construction in 2014 and is expected to open in 2019 under the Saskatoon Health Region. Headquarters for the Saskatoon Police Service. The service provides municipal policing for the city. The Saskatoon Police Service is the primary police service for the city of Saskatoon and holds both Municipal and Provincial Jurisdiction. The following services also have jurisdiction in Saskatoon: Corman Park Police Service, Royal Canadian Mounted Police, Canadian National Railway Police Service and the Canadian Pacific Railway Police Service. As of December 31, 2012, the SPS had 442 sworn members, 59 Special Constables, and 136 civilian positions. The 2006 census crime data, released July 18, 2007, showed Saskatoon leading Canada in violent crime, with 1,606 violent crimes per 100,000 residents annually. However, crime statistics produced by the Saskatoon Police Service shows that crime is on the decline. In 2010, total crimes against people went up 1.28% and total crimes against property fell by 11.75%. There were accusations in the early 1990s that the Saskatoon police were engaging in starlight tours, where officers would arrest Aboriginal men and drive them out of the city in the dead of winter to abandon them. The majority of the accusations turned out to be false; however, several starlight tours did take place. Broadway Bridge is one of several bridges that crosses over the South Saskatchewan River. Construction of Saskatoon's ring road, Circle Drive, began in the mid-1960s (after first being proposed in 1913), and was completed on July 31, 2013 with the opening of the $300-million South Circle Drive project. The Saskatoon John G. Diefenbaker International Airport is the international airport for the Saskatoon metropolitan area. The Canadian Pacific Railway and the Canadian National Railway have connections to Saskatoon. Both railways operate intermodal facilities and trans-load centres; while Canadian National Railway also operates an automotive transfer facility. Saskatoon is a stop on The Canadian passenger transcontinental rail route operated by Via Rail. The Saskatoon railway station is in the city's west end; it opened in the late 1960s as a replacement for Saskatoon's original main station which was on 1st Avenue downtown—the relocation of the station sparked a major redevelopment of the downtown that included the construction of the Midtown Plaza, TCU Place (aka Centennial Auditorium) and other developments. The many provincial transportation connections and geographic location of Saskatoon give it one of its nicknames The Hub City. The Saskatchewan Railway Museum is just outside the city. Recent debates about moving all the railways out of the city are raising questions about a future LRT system, but the city's Mayor says the population is too small. 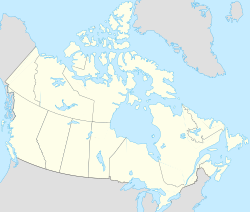 Saskatoon/John G. Diefenbaker International Airport, located in the city's northwest, provides scheduled and charter airline service for the city, and is a significant hub for mining and remote locations in Northern Saskatchewan. Non-stop scheduled destinations include Calgary, Edmonton, Las Vegas, Minneapolis, Ottawa, Prince Albert, Regina, Toronto, Vancouver, and Winnipeg. Seasonal and Charter service is provided to Mexico, Cuba, Dominican Republic, Phoenix and Churchill, MB. Air Canada, Westjet and Purolator Courier all have cargo facilities at the airport. Saskatoon/Corman Air Park is a general aviation airport 15 km south-east of Saskatoon. Transit services in Saskatoon are provided by Saskatoon Transit. The route system was revamped on July 2, 2006, creating increased access to most parts of the city. An up-to-date schedule is posted at Saskatoon Transit Route & Schedule Adjustments. Saskatoon was serviced by Greyhound Canada for inter-provincial bus service between Manitoba and Alberta until Greyhound discontinued service on October 31, 2018. The Peter MacKinnon Building at the University of Saskatchewan. A National Historic Site, the building represents an example of early-20th century Collegiate Gothic designs. St. Thomas More College is a Catholic federated college of the University of Saskatchewan. Affiliated with the University of Saskatchewan are the Lutheran Theological Seminary, College of Emmanuel and St. Chad (Anglican Church of Canada), and St. Andrew's College (United Church of Canada). All three are on the university campus. The First Nations University of Canada – Saskatoon campus. Saskatoon has 78 elementary schools and 14 high schools, serving about 37,000 students. Saskatoon has three main school boards, the Saskatoon Public School Division, the Saskatoon Catholic School Division and the Conseil des Ecoles Fransaskoises. The western annexation of what is now called the Blairmore SDA also brought the Yarrow Youth Farm within the city limits; operated by the Province of Saskatchewan, this was a correction facility for at-risk youth. The facility was subsequently closed in March 2015 and the land, located within the under-development Kensington community, was out up for sale the following autumn. SaskTel Centre is a multi-purpose arena, home to the WHL's Saskatoon Blades and the NLL's Saskatchewan Rush. Ice hockey is one of the most popular sports in Saskatoon and is home to numerous amateur teams such as the Saskatoon Blades of the WHL, who host their games in SaskTel Centre (formerly known as Credit Union Centre and Saskatchewan Place). Saskatoon is also home to amateur teams at the Junior B and Midget AAA levels, as well as several youth teams. Saskatoon was a major league hockey city from 1921 to 1926 when the WCHL/WHL Sheiks/Crescents played. They made it as far as the league semi-finals twice, not far enough to challenge for the Stanley Cup. The biggest chance for a return of major professional hockey came in 1982. Bill Hunter, a local sports promoter, attempted to purchase the St. Louis Blues of the NHL and move it to Saskatoon, but the move was prevented by the league. This was due to Saskatchewan's and especially Saskatoon's small size in relation to both St. Louis and the other cities in the NHL at the time. However, it did cause the building of the Credit Union Centre, on the city's northern edge. Prior to hosting the 2010 World Junior Hockey tournament, the arena underwent a major expansion which increased seating capacity to approximately 15,000 and also created several new box suites. Starting in 2016, the Saskatchewan Rush played in the National Lacrosse League after moving from Edmonton. The Saskatchewan Rush won the league Championship against the Buffalo Bandits that same year. Griffiths Stadium is an outdoor stadium used primarily by the University of Saskatchewan's varsity teams, the Huskies. Canadian football is one of the most successful on field sports in Saskatoon. The University of Saskatchewan Huskies are one of the top University football programs in Canada, with three Vanier Cup national championships and 19 Hardy Trophy Canada West championships. The Huskies have made nine Vanier Cup appearances since 1990, and were the first team from outside of Ontario to host the Vanier Cup, hosting the game in 2006. As well, the Saskatoon Hilltops of the Canadian Junior Football League host their games at Gordie Howe Bowl. The Hilltops have won 19 national junior championships throughout their history. The University of Saskatchewan Huskies play Canadian Interuniversity Sport league games at the University Campus. Their facilities include 6,171 seat Griffiths Stadium, 700 seat Rutherford Arena, and the state-of-the-art Physical Activity Complex, opened August 2003 in conjunction with the new College of Kinesiology Building. The Huskies participate in twelve sports at the CIS level and have been most successful in football (Conference champions 18 times/National champions 3 times), men's volleyball (Conference champions 11 times/National champions 4 times) women's basketball National Champions once and men's and women's Track and Field(Conference champions 37 times/ National champions 12 times). Saskatoon is also currently constructing a new arena to be home of the university hockey team. This complex will consist of two areas and a hard court surface for indoor sports events such as soccer. The area is being constructed on the university campus. The Saskatchewan International Raceway is a drag racing facility located outside the city limits. The facility features a ¼ mile NHRA-sanctioned dragstrip. In 2007, two new sports teams came into being in Saskatoon, the Saskatchewan SWAT of the Rocky Mountain Lacrosse League and the Saskatoon Accelerators in the Canadian Major Indoor Soccer League. The Accelerators play at the Kinsmen/Henk Ruys Soccer Centre, while the SWAT play at the Gordie Howe Kinsmen Arena. There are currently no baseball teams in Saskatoon. In the past there have been various teams including the Saskatoon Yellow Jackets, Saskatoon Riot, Saskatoon Smokin' Guns, Saskatoon Stallions, and the Saskatoon Legends. Motor racing is a popular sport in Saskatoon. Saskatchewan International Raceway has been in operation for over 40 years; SIR is home to 1/4 mile NHRA drag racing and holds racing events from May to September. As well, just north of the city lies Wyant Group Raceway; the track is home to local stock car racing, as well as races for several different Western Canadian series. In 2009, the NASCAR Canadian Tire Series make its inaugural stop at Wyant Group Raceway, Formerly known as Auto Clearing Motor Speedway, signaling a move to a larger profile track in Saskatoon. Marquis Downs at Prairieland Park offers live horse racing from May to October. The city also is home to a number of sports and recreation centres, including two full size soccer facilities under the control of the non-profit Saskatoon Soccer Centre organization. The Kinsmen/Henk Ruys Soccer Centre is composed of four sport court indoor fields and the SaskTel Sports Centre hosts two full sized outdoor turf fields, one indoor full sized turf field, one indoor half sized turf field, and one sport court field. Lions Skatepark was built in the Riversdale area in 2003. As well Saskatoon is home to several golf courses and various parks which include tennis courts, ball diamonds and soccer pitches for spring, summer and fall use and outdoor rinks for winter use. Blackstrap Ski Hill is also 30 minutes south of the city, however, has been closed since 2006 due to financial difficulty. 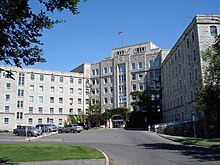 The Royal University Hospital is one of four institutions in Saskatoon that was designated with royal status from the Canadian monarchy. The hospital received royal status from Queen Elizabeth II in 1990. Saskatoon has welcomed members of the Royal Family since 1919. The Queen most recently visited for a gala concert at Credit Union Centre, before a live audience of 12,000 and television viewers nationwide in 2005. The Queen was presented with the key to the city on the same visit, after touring the Canadian Light Source synchrotron and greeting thousands of well-wishers on a walkabout at the University of Saskatchewan (the Queen traditionally stays at the on-campus residence of the President of the University of Saskatchewan when she visits the city). Sovereigns and consorts who have visited include Edward VIII as Prince of Wales in 1919, King George VI and Queen Elizabeth in 1939, and Elizabeth II and the Duke of Edinburgh, as Princess Elizabeth in 1951 and afterwards as Queen in 1959, 1978, 1987 and 2005. Other members of the Royal Family who have visited include Princess Margaret, Countess of Snowdon in 1980, the Prince of Wales (Charles) in 2001, the Princess Anne in 1982 and (as Princess Royal) in 2004, the Duke and Duchess of York (Andrew and Sarah) in 1989, and the Prince Edward in 1978. Governors General and Lieutenant Governors also pay regular visits to Saskatoon. Saskatonian Ray Hnatyshyn is credited with popularising his office as Governor General from 1990 to 1995. Saskatchewan Lieutenant Governors Barnhart, Fedoruk, McNab, Monroe, Porteous and Worobetz were all former residents of Saskatoon. Connections to the crown include the royal namesakes of about one hundred neighbourhoods, parks, streets, schools and other places. These include King George, Queen Elizabeth and Massey Place neighbourhoods, and Victoria, Coronation and Princess Diana parks. It was at one time considered that Saskatoon's Broadway Bridge would be renamed George V Bridge. Landmarks and institutions also have connections and these include the Royal University Hospital, one of four royal designations in Saskatchewan. Grade schools named for royals include Ecole Victoria School, King George School, Queen Elizabeth School, Prince Philip School and Princess Alexandra School. Existing and historic hotels with royal namesakes include the King George Hotel which has been recently converted to ultra-luxury condominiums, the King Edward Hotel, the Queen's Hotel and the Patricia Hotel. The Hotel Bessborough was named for a Canadian Governor General who visited the landmark under construction in the 1930s. The Queen Elizabeth Power Station is within the city and named after Queen Elizabeth. The Prince of Wales Promenade along the South Saskatchewan River is a focal point on the riverfront trails. In 2002, 378 Saskatoon residents were presented with Canada's Golden Jubilee Medal by vice-regals to commemorate the fiftieth anniversary of the Queen's accession to the throne. ^ Climate data was recorded on the University of Saskatchewan campus from 1915 to 1966. In 1966 the station was moved 4km northeast to the current location, near Attridge and Circle Dr.
^ Edmonton, The (April 30, 2007). "Edmonton Journal, "Paris of the Prairies"". Canada.com. Archived from the original on August 21, 2012. Retrieved September 8, 2012. ^ "A Brief History of Saskatoon" (PDF). City of Saskatoon. Archived from the original (PDF) on January 3, 2015. ^ "DCHP-2". Retrieved May 22, 2018. ^ a b "Quick Facts". City of Saskatoon. Archived from the original on February 4, 2014. ^ "History". City of Saskatoon. Retrieved June 8, 2016. ^ a b "City of Saskatoon website". City of Saskatoon. December 31, 2016. Retrieved February 18, 2017. ^ a b "Population of census metropolitan areas". Statistics Canada. February 10, 2016. Retrieved February 18, 2017. ^ "A History of Saskatoon to 1914" (PDF). web.archive.org. July 2005. Archived from the original (PDF) on October 3, 2006. Retrieved April 4, 2009. ^ O'Brien, Jeff; Ruth W. Millar, William P. Delainey (2006). Roberta Coulter (ed.). Saskatoon: A History in Photographs. Coteau Books. p. 88. ISBN 1-55050-336-7. ^ "City Planning". City of Saskatoon. Archived from the original on June 7, 2008. Retrieved July 10, 2009. ^ "Plant Hardiness Zone by Municipality". Government of Canada. Retrieved July 31, 2016. ^ "Frost Chart for Canada". The Old Farmer's Almanac. Retrieved October 6, 2012. ^ "Backgrounder: What is the Climate Reference Station (CRS)?". Retrieved October 31, 2009. ^ "Climate Data Almanac for July 31". Environment Canada. Retrieved September 27, 2016. ^ "Climate Data Almanac for August 8". Environment Canada. Retrieved September 27, 2016. ^ "Worst blizzard in years blasts Saskatchewan". CBC News. January 10, 2007. ^ "Blizzard blasts Saskatoon". .canada.com. December 12, 1955. Retrieved May 5, 2011. ^ "Saskatoon 2". Canadian Climate Data. Environment Canada. Retrieved May 30, 2016. ^ a b "Saskatoon Diefenbaker INT'L A". Canadian Climate Normals 1981–2010. Environment Canada. Retrieved May 12, 2014. ^ "Climate Reference Station - Saskatoon - Annual summary 2015" (PDF). SRC. University of Saskatchewan. Archived from the original (PDF) on April 23, 2016. Retrieved April 13, 2016. ^ a b "Saskatoon SRC". Canadian Climate Normals 1981–2010. Environment Canada. Retrieved April 13, 2016. ^ "Saskatoon U of S". Canadian Climate Data. Environment Canada. Retrieved April 13, 2016. ^ https://www12.statcan.gc.ca/census-recensement/2016/dp-pd/prof/details/page.cfm?Lang=E&Geo1=CSD&Code1=4711066&Geo2=CD&Code2=4711&Data=Count&SearchText=saskatoon&SearchType=Begins&SearchPR=01&B1=All&TABID=1 Census Profile, 2016 Census Saskatoon, City [Census subdivision]. Statistics Canada. Retrieved 6 January 2019. ^ "Statistics Canada, 2001 census". 0.statcan.gc.ca. August 14, 2009. Retrieved May 5, 2011. ^ "2016 Community Profiles". 2016 Canadian Census. Statistics Canada. February 21, 2017. Retrieved July 28, 2017. ^ "2011 Community Profiles". 2011 Canadian Census. Statistics Canada. July 5, 2013. Retrieved February 8, 2012. ^ "2006 Community Profiles". 2006 Canadian Census. Statistics Canada. March 30, 2011. Retrieved March 6, 2011. ^ Statistical Profile of Canadian Communities Archived September 22, 2016, at the Wayback Machine, Statistics Canada, February 9, 2016. ^ "High percentage of seniors, kids in Saskatchewan: StatsCan - Saskatchewan — CBC News". Cbc.ca. July 17, 2007. Retrieved May 5, 2011. ^ "Statistics Canada, 2001 Census". 2.statcan.ca. March 9, 2010. Retrieved May 5, 2011. ^ a b c "Statistics Canada, 2001 Census". 2.statcan.ca. March 12, 2002. Retrieved May 5, 2011. ^ Aboriginal Conditions in Census Metropolitan Areas, 1981–2001 Archived July 3, 2007, at the Wayback Machine, Statistics Canada, ISBN 0-662-40884-5, Table 1. ^ Aboriginal Conditions in Census Metropolitan Areas, 1981–2001 Archived July 3, 2007, at the Wayback Machine, Statistics Canada, ISBN 0-662-40884-5, Figure 3. ^ "Home - Folkfest 2015". Folkfest 2015. ^ "Canada Remembers Airshow". canadaremembersairshow.com. ^ "1st-ever Saskatoon Sikh Parade was so busy it spurred a traffic advisory". Retrieved April 28, 2018. ^ "Art Gallery of Saskatchewan at River Landing". Retrieved June 24, 2010. ^ "Mendel Art Gallery provides impetus for new building". Archived from the original on June 12, 2010. Retrieved June 24, 2010. ^ "CBC News: Mendel art gallery gets makeover in Saskatoon: new home, new name". April 3, 2009. Retrieved July 26, 2010. ^ "Save the Mendel website". Retrieved July 26, 2010. ^ "Saskatoon StarPhoenix: Mendel memory may disappear". Retrieved July 26, 2010. ^ "New York Times 52 places to Go in 2018 ~ A starter kit for exploring the world". Retrieved January 12, 2018. ^ "52 Places to Go in 2018". The New York Times. 2018. ISSN 0362-4331. Retrieved March 19, 2018. 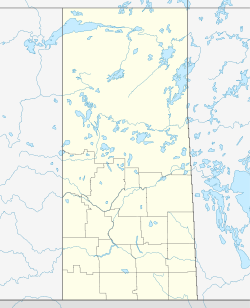 ^ "Meewasin Valley Centre". Archived from the original on May 14, 2008. Retrieved March 10, 2008. ^ "Downtown Capitol Theatre to close for good April 3". The StarPhoenix. March 23, 2008. Archived from the original on August 27, 2012. Retrieved April 3, 2008. ^ "Saskatoon Through the Ages – At the Movies: A Photographic Exhibition". Saskatoon Public Library. 2009. Retrieved July 10, 2012. 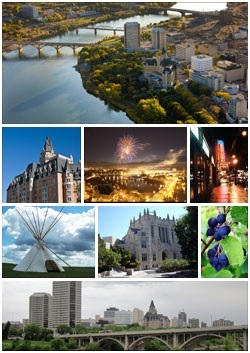 ^ "History of Saskatoon, Saskatchewan". Saskatoonkiosk.ca. Retrieved May 5, 2011. ^ "Meewasin Trail and Facilities". Archived from the original on August 28, 2011. Retrieved March 10, 2008. ^ "River Landing – Saskatchewan's premier residential and destination tourist centre!". Riverlanding.ca. Retrieved May 5, 2011. ^ "River Landing Village". Lakeplacidsaskatoon.com. December 4, 1999. Retrieved May 5, 2011. ^ "Money for Saskatoon complex coming, developer says". CBC News. November 17, 2009. ^ "Funds pledged for $51M Saskatoon art gallery". CBC News. September 23, 2009. ^ a b Parker, Rob. "How Saskatoon Got the Nickname POW". Retrieved April 25, 2009. ^ a b SREDA (April 6, 2009). "Saskatoon Emerges As Fastest Growing City In Canada". AHN. Archived from the original on April 9, 2009. Retrieved April 26, 2009. ^ "Saskatchewan's Economy". About Saskatchewan/Economy. Government of Saskatchewan. Archived from the original on December 19, 2008. Retrieved January 16, 2009. ^ "Innovation Place Saskatoon". Archived from the original on September 28, 2011. Retrieved April 26, 2009. ^ Cutler, Jeffrey; Hallin, Emil; de Jong, Mark; Thomlinson, William; Ellis, Thomas (2007). "The Canadian Light Source: The newest synchrotron in the Americas". Nuclear Instruments and Methods in Physics Research A. 582: 11–13. doi:10.1016/j.nima.2007.08.086. ^ "Information and Communications Technologies". Saskatoon Regional Economic Developer Authority. Archived from the original on April 23, 2016. Retrieved April 7, 2016. ^ "TP141 – Aircraft Movement Statistics". Tc.gc.ca. January 12, 2011. Archived from the original on June 7, 2011. Retrieved May 5, 2011. ^ River Landing Archived October 6, 2016, at the Wayback Machine. Retrieved February 4, 2007. ^ The Partnership Archived March 11, 2016, at the Wayback Machine. Retrieved February 4, 2007. ^ "Direct Control District No. 1 (DCD1) for The South Downtown" (PDF). City of Saskatoon. August 27, 2004. Archived from the original (PDF) on March 27, 2012. Retrieved November 10, 2010. ^ Community Service Department, City Planning Branch (June 2000). "Future Growth Study" (PDF). City of Saskatoon. Archived from the original (PDF) on August 7, 2012. Retrieved April 26, 2009. ^ "Saskatoon—Canadian leader in economic growth in 2005. (gross domestic product)". Sask Business. March 1, 2006. Archived from the original on November 2, 2012. Retrieved April 26, 2009. ^ "Economic News". Enterprise Saskatchewan. Government of Saskatchewan. September 19, 2008. Archived from the original on July 6, 2011. Retrieved April 26, 2009. ^ "Saskatoon Health Region List of Hospitals". Saskatoonhealthregion.ca. Archived from the original on July 6, 2011. Retrieved May 5, 2011. ^ "Designs for $230M Children's Hospital unveiled – Saskatchewan – CBC News". Cbc.ca. July 12, 2012. Retrieved September 8, 2012. ^ "Jim Pattison Children's Hospital – Preparing for Opening Day - Overview". Saskatoonhealthregion.ca. Retrieved July 17, 2017. ^ "Saskatoon Police Service Annual Report 2010" (PDF). Saskatoon Police Service. Retrieved January 29, 2012. ^ "New film renews community discussion about Aboriginal freezing deaths in Saskatoon". Dispatch. University of Regina. Retrieved February 15, 2010. ^ "Saskatoon police chief admits starlight cruises are not new". Windspeaker. Aboriginal Multimedia Society of Alberta. July 1, 2003. Retrieved February 15, 2010. ^ Saskatoon's south bridge finally becoming a reality Archived January 4, 2016, at the Wayback Machine, Saskatoon StarPhoenix, June 20, 2008. Retrieved July 11, 2008. ^ "Proximity Railway Map for Saskatoon" (PDF). Archived from the original (PDF) on May 25, 2011. Retrieved May 5, 2011. ^ "Experts say early move to LRT wise". The StarPhoenix. Canada.com. May 24, 2008. Archived from the original on August 27, 2011. Retrieved February 1, 2012. ^ "Greyhound Cancels Most Routes in Western Canada". Globe and Mail. July 9, 2018. Retrieved December 31, 2018. ^ "Yarrow Youth Farm land for sale". StarPhoenix. October 24, 2015. Retrieved December 31, 2018. ^ "U of S Huskie Athletics – Football". Huskies.usask.ca. Archived from the original on September 26, 2012. Retrieved May 5, 2011. ^ "U of S Huskie Athletics – Volleyball". Huskies.usask.ca. Archived from the original on September 30, 2011. Retrieved May 5, 2011. ^ "U of S Huskie Athletics – Track & Field". Huskies.usask.ca. Archived from the original on February 5, 2012. Retrieved May 5, 2011. Wikimedia Commons has media related to Saskatoon. Look up saskatoon in Wiktionary, the free dictionary. Wikivoyage has a travel guide for Saskatoon.